Create cost-effective paper labels for packages, envelopes, file folders, discs, banners, postage*** and more. Ultra-fast, high-quality printing at up to 93 labels per minute*. auto cutter gives a clean and accurate finished edge and allows for printing 1 or multiple labels at a time, eliminating wasted label sheets. The “plug & label” feature supports quick label printing of most basic labels - no software installation required. ** for advanced applications, such as bar code labels use the included P-Touch editor software. Print from Microsoft word/excel/Outlook. 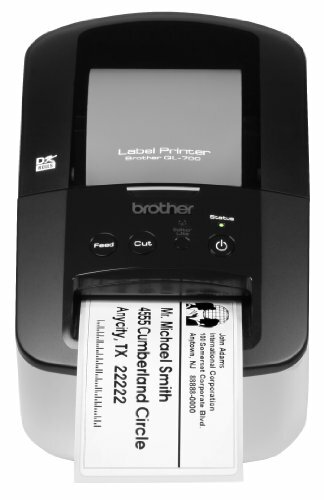 Wide variety of convenient, drop-in labeling supplies available. Needs no ink or toner. Create cost-effective paper labels for packages, envelopes, file folders, discs, banners, postage and more.